One of the things I really love about yoga is that it recognises we human beings are complex! When we look at something like stress and how to manage or reduce it, we need to understand that stress affects us in a number of ways and so usually a multi-faceted approach works best. Sadly there is no silver bullet or magic pill. It’s estimated that 90% of all doctor-visits have stress as a contributory factor. Look at any chronic health condition and you can be sure stress plays a role – even in the unlikely event that stress didn’t play a role in the onset of the illness, you can be sure stress will be a symptom of whatever health complaint someone has. After all being sick, being injured, being in pain are all stressful issues to deal with! So we know stress affects our bodies physically but we also need to address the toll stress takes on our mental health, our emotional outlook, our lifestyle habits, behaviours and routines. When stress gets really bad it can rock us to the very core making us question our priorities, whats important and the very meaning of our lives. In yoga we understand that people are multi-layered. At the most tangible gross level we have the physical body, made of bones, muscles and connective tissue. Going a little deeper we have an understanding of the various systems of the body such as the nervous system or circulatory system and also how well energy or ‘prana’ flows through these. Deeper and subtler still we have the emotional, mental and spiritual layers encompassing all our dreams, hopes, thought patterns and moods. Finally at the most subtle level we have the soul – that indefinable ‘something’ that makes someone uniquely them. It’s helpful to think of these layers like those Russian dolls – each layer goes progressively more inward towards the core, with the soul lying right at the center. These layers are call koshas. 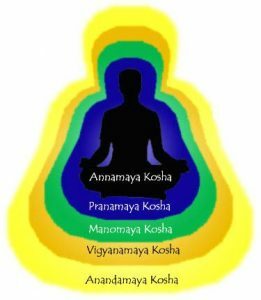 When it comes to learning how to reduce or manage our stress better, for the best results yoga asks us to take an integrated approach and address whats happening at all these different layers or koshas. Dealing with just one level is incomplete. For example, I may have a client who is only interested in working at the physical level and part of my role is to show them how their poor breathing patterns are contributing to their feelings of stress, or how their thought patterns or lifestyle choices are an exacerbating factor. So let’s take a look at the 5 major areas we need to address when we’re learning to manage our own stress levels. I’ll deal with the first 2 in this blog post – stay tuned for the final 3 in The Complete Guide to Using Yoga for Stress Management – Part 2. Stress takes its toll on the body there’s no doubt about it. When our ‘fight-and-flight’ button is switched on we experience a cascade of physiological reactions that help us meet the perceived threat. The body releases stress hormones such as cortisol and adrenaline which in turn lead to increases in blood pressure, heart rate and blood sugar levels. It’s important to recognise that stress is a normal healthy reaction to a perceived threat. In a normal healthy body there is the ability to effortlessly shift between stress response and relaxation response, often many times throughout the course of the day. The problem these days is that our bodies are getting stuck in stress response mode and over time chronic stress can lead to problems with digestion, immunity and nervous system functioning. Stress can also manifest in the muscles and connective tissues as chronic tension, gripping, muscle spasm and pain. One key way therefore to manage stress is to address and reduce its negative affect on the physical body. Exercise, yoga asana (posture) practice and body scan meditations all provide excellent ways for us to get us out of our heads and into our bodies. These practices can help us become aware of and understand where we typically hold our stress in our bodies. For some, it might be a tightening in the chest, or a gripping in the gut, for others it might be a clenched jaw and sore, painful shoulders. Everyone’s physical holding patterns are unique. How exactly does yoga asana help to reduce stress? Yoga postures help to reduce chronic tension, muscle spasms and pain by simultaneously lengthening and strengthening the muscles and connective tissue. This promotes better posture and joint bio-mechanics and improves circulation and blood flow to the area. Evidence suggests that our posture has a profound impact on our mental and emotional health. One great teacher Darren Rhodes puts it like this “Shape shift in order to state shift” – by actively changing the way we hold our bodies in space we can improve our mood and the way we feel. Yoga asana provides the perfect gateway to the quieter, stiller practices of meditation by helping to burn off restless energy and fidgetiness so that we can relax and focus. Asana practice also gives the mind something to chew on so its less likely to ruminate over other potential stresses. The asanas can teach us skills around resilience, equanimity and non-reactivity. We learn to stay with and breathe through difficult/challenging physical situations without automatically switching to fight or flight mode. We then take these skills off the mat and into the world. There’s a reason yogis bang on and on about the breath! The breath mirrors the mind and the mind mirrors the breath. Pause for a moment and contemplate the profound implications of that statement. What it means is that by changing the way we breathe we can go a long way to changing the way we feel on a physical and mental level. When we’re feeling stressed, unconsciously our breathing will tend to become shorter, shallower and we’ll feel it mainly just around the collarbones, throat and/or upper chest. This type of breathing in turn will lead to making you feel more anxious, stressed and panicky – it can be a vicious cycle. So when you feel your blood pressure rising, or the anxious thoughts are whirling, take some time out to manage your breathing. One of the simplest and yet most powerful techniques I teach my students is to learn how to breathe in a way that fully utilises the diaphragm muscle. The diaphragm is the muscle that attaches to the bottom circumference of the ribcage and separates the abdominal organs from the chest cavity. When we breathe using the diaphragm, on the inhale you’ll notice your abdomen and lower ribs gently swelling outwards and on the exhale you’ll feel the belly soften slightly back towards the spine. When we breathe in this way it stimulates the vagus nerve which in term triggers the relaxation response. When we practice diaphragmatic breathing we’re also aiming to breathe smoothly and steadily without jerkiness or hiccups and breathe in a way that is relatively quiet and without tension in the throat. To make this even more powerful as a stress management technique, concentrate on gradually extending your exhalation, eventually building up to making the exhale twice as long as the inhale. Yoga has a whole host of amazingly soothing breath techniques to calm stress-levels. Another one to try out and one of my all time favourites is nadi-shodhana or alternate nostril breathing. Here’s a link to it being taught online. How exactly does breathwork help to reduce stress? Breathwork improves blood and lymphatic circulation which becomes impaired with our increasingly sedentary lifestyles. 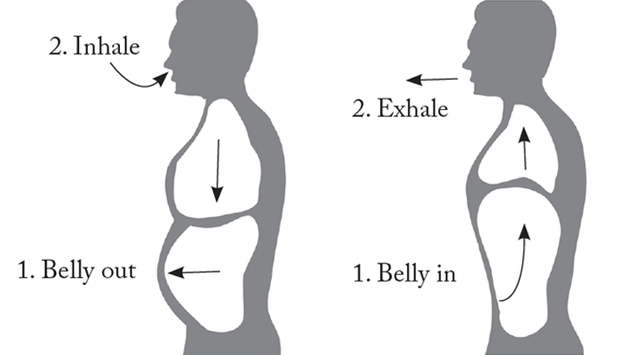 Breathwork improves digestion and elimination helpful in disorders such as IBS and bloating. Breathing using the diaphragm puts the body into a relaxation response helping to combat fatigue, chronic stress and anxiety. Regular breathing practices maintain and develop suppleness/elasticity of the ribs, costal cartilage, and the muscles that support/mobilize the spine. Breath is an incredible tool for helping us to make peace with change and to recognise the impermanence in all things. As we watch the breath ebb and flow we are reminded that nothing is permanent including difficult moments, fears and periods of anxiety. Breathing techniques develop our ability to focus and concentrate. We learn to control where our attention and therefore our thoughts go to. The breath immediately brings us back into the present – we can only ever breathe for the now, this moment which in turn helps to settle the mind. Breathing teaches us to be less reactive – when we observe the breath we discover a gap between our observation of our immediate experience and whether we choose to respond to something. We notice and develop this through the natural pause that occurs between the end of one breath and the uptake of the next. Focusing on, and adopting specific breathing techniques can change our energy levels to promote more balance e.g. slower breathing tends to relax the nervous system, faster breathing tends to energise/stimulate us. The former serves well as a preparation for meditation. This is a question I have come back to time and time again since I started down the teaching yoga path. What are we really teaching when we say we teach yoga? This question often creeps up on me during those times of self-doubt, where I feel like I’m getting bogged down in too much detail. When I feel my teaching starts becoming finicky and dry from too much emphasis on technical alignment, or I find my sequences becoming unnecessarily busy or complex. When I feel that I’ve placed too much emphasis on the pose rather than on the person. I sense this is a common trap that many of us fall into both as yoga teachers and yoga practitioners. This idea that the pose is somehow king. That yoga and physical posturing are one and the same thing. I would argue that it’s possible to do an entire physical asana practice that doesn’t contain an ounce of yoga in it if there isn’t at least some effort to maintain, breath, presence and sensitivity. I also know (and have met) many people who I think are more ‘yogic’ than I’ll ever be and have yet to set foot on a sticky mat. What both of these quotes suggest is that the physical practice is merely a means towards accessing something far bigger and deeper than just our physical body. The poses are not themselves the yoga, but if we’re lucky they might lead us to it. Yoga therefore is not a noun – it’s not something you ‘do’, but something you ‘become’. Yoga is an experience. I think this is an important distinction to make because it fundamentally shifts the emphasis of our teaching. Rather than teaching people how to twist, balance on their hands, fold forwards or backbend as a means to an end, we’re teaching these things merely as an aid to self-discovery, as a tool for helping people to explore themselves more deeply. Now when I teach and emphasise alignment in class, it’s less about trying to get people into a physical pose and more about using attention to alignment as an aid to building greater focus and attention. Research now clearly shows how important the simple ability to stay present and attentive plays in how happy and meaningful we perceive our lives to be. This is also one of the reasons why I still shy away from an Instagram account – don’t get me wrong there’s some beautiful asana photography out there and it’s lovely to look at, but I worry that people start to equate this with yoga. That it opens up a space for people to see their yoga as something that you ‘do’, something that you compare yourself against others and value purely from the aesthetic level. essentially many of the same skills that I am still working on daily to cultivate in myself. Qualities such as compassion, patience, self-friendliness, discernment, resilience and the never-ending work of remaining skillfully present amidst all of life’s twists and turns. These are the kinds of skills that really mean something. Your ability to handstand or to touch your head to your shins will ebb and flow with the capricious and endlessly changing nature of our physical bodies. When we couch our sense of self-worth based on physical feats of prowess we’re on a slippery slope to frustration, disappointment and disillusion. The body will age, the body will fail us at some point – this is a game we can not win. We must look therefore to our teachers and ourselves to find something deeper within this practice, something enduring and worth the rigors and discipline required of our work on the mat. Then, rather than seeing the pose as an end point, we can value the poses as a beginning – an entry-point into exploring and uncovering the very best versions of ourselves. What’s the Best Way to Work With Injured Students as a Yoga Teacher? As a yoga therapist, I work with a lot of injured students. Many of my private clients come to me initially to see if yoga can help them manage the pain and discomfort of an injury or musculo-skeletal imbalance. Judging from the number of doctor’s referrals these days it seems that yoga is increasingly being seen as a valid and effective tool for helping people to manage their injuries – this is great news! As a yoga therapist it’s not our role to diagnose an injury and I often seek out other health professionals such as doctors or physios to confirm the exact nature of the injury. As yoga therapists this is perfectly fine as we’re not looking to treat the diagnosis, but rather to get to the root of the cause. For it’s in the cause that we can discover why someone got injured and therefore what steps can be taken both to heal the injury, but also ensure that it does’t reoccur. As such, yoga therapy is as much interested in prevention as cure. One of the great advantages of yoga for injury rehab is that it seeks to understand the cause of someone’s injury from a number of different perspectives or levels, rather than just the physical. In yoga therapy we work with a model called the Koshas, which suggests that we are composed of five layers (or sheaths) that resemble the structure of Russian dolls. These five sheaths are metaphorical rather than literal, and move from the most gross, tangible and outer aspects of who we are such as our physical body, to the ever more subtle, intangible and inner layers of our breath or energy flow, mind state, wisdom and spirit. These five sheaths are interrelated, and so discord or imbalance in one will lead to disharmony across all. With this in mind, physical injury can be seen not only as discord in the outer physical body (called the Anamaya Kosha or food body) but also as a disruption within other Koshas. For example, injury might suggest a disruption of healthy energy (prana) flow, and certainly injuries can have an impact on our psycho-emotional state. For this reason, as a yoga therapist, when I take a case history of someone’s injury I’m interested not only in someone’s medical history but also in factors such as their lifestyle, cultural and environmental influences, and even beliefs, thoughts and feelings they might have around their body and its perceived limitations/capabilities. All of these factors can give us a richer and more nuanced insight into the causes and consequences of their injury. Yoga therapy is often interested in patterns and the connections between seemingly disparate parts of the body. It recognises that the site of pain or chronic injury is rarely the source of the problem rather we have to look further up and down the kinetic chain. For example, a chronic injury in the wrist may well have its roots in some sort of imbalance further up in the shoulder or neck. For this reason, one of the first things I tend to do with an injured student is review their posture and if appropriate, their gait. I might also get them to mimic for me their preferred way of sitting or standing to get an idea of their postural patterns throughout the day. Postural assessment can be an easy way to see musculo-skeletal imbalances in action, which will then give you a feel for where your focus needs to be during the yoga session. As Patanjali mentioned all those years ago in the Yoga Sutras, the key to a successful and sustainable yoga practice (and a healthy happy body) is by finding a balance between sthira (strength and stability) on the one hand and sukkha (ease and flexibility) on the other. Injury tends to occur when there is an imbalance – too much flexibility/pliability or too much rigidity/tension in the musculo-skeletal system. When an injured student comes to me we’ll often spend a fair amount of time trying to strengthen and stabilise the areas of the body that are weak or inhibited, and stretching out or releasing the areas that are short and tight. Although this seems like common sense it amazes me how often people don’t seem to realise that yoga is every bit as much about strength as it is about flexibility and increasing range of motion. In fact it requires a lot of strength to safely sustain big ranges of motion – the more flexible you are, the more you’ll need stability work. Exploring and working with the breath is fertile ground for the yoga therapist because breath is a mirror for both the state of our nervous system and our mental and emotional landscape. Getting injured and being in pain is often a stressful event, particularly if the injury is preventing someone from doing their normal daily activities or from playing their favourite sports. There may be all sorts of related fears associated with being injured, such as worries that the injury won’t go away or concerns about the financial costs of getting it fixed. All of these factors can exacerbate our feelings of stress, which typically leads to dysfunctional breathing patterns that further ignites the sympathetic nervous system, commonly known as the body’s fight-or-flight response. This is one of the reasons that I often start a yoga therapy session with teaching students how to breathe using the diaphragm. The diaphragm muscle that spreads across the bottom of the rib-cage innervates with the vagus nerve, which in turn stimulates the parasympathetic or rest-and-digest part of our nervous system. This is not only essential for helping our body to restore and repair itself, but can be a great gateway to soothing and settling the mind and emotions. When we get injured it can sometimes feel like our bodies are working against us. Feelings of inadequacy, fragility, frustration and hopelessness can lead to a fractured and dysfunctional body image. One of the key things I hope to offer students is an opportunity to befriend their bodies, and to see themselves as so much bigger than their injury. The model of the Koshas reminds us that we are so much more than just the muscles, bones and connective tissue of our physical body. Learning to view our injuries with a greater level of friendliness, compassionate curiosity and kindness is like a healing balm that can go a long way on our journey back towards health and wellbeing. Welcome to Surrey Yoga Therapy. My name is Vicky Arundel and my mission is simple – to help you discover optimal wellbeing through the healing power of yoga. Yoga that is specifically tailored to you. To learn more about how Surrey Yoga Therapy protects your data please click here.